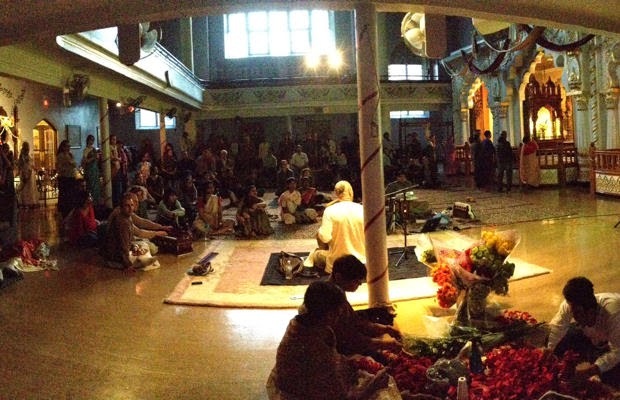 A "Panoramic" View of the Bhajan Night with Vaisesika Prabhu ~ The Toronto Hare Krishna Temple! Our Toronto Hare Krishna community is always excited to welcome HG Vaisesika das and HG Nirakula devi dasi to our community! Amidst the whirlwind of programs that are typically held during their visits, the Saturday evening is always reserved for a "bhajan night", an evening of musical chants with HG Vaisesika das! Priya Rupa devi dasi, a member of our community captured this unique "panoramic" perspective of the evening! Feel free to submit your own photos of the temple or our community in action and we will post them on our website. Click the image below for a zoomed in version!